Millions of Americans will be diagnosed with skin cancer annually and over 80,000 diagnoses will be melanoma, skin cancer’s deadliest form. Myth — It is impossible to get skin cancer in an area of the body that has never been exposed to the sun. Fact — Sun exposure is a risk factor for developing skin cancer, these cancers can develop anywhere on the body regardless of direct sun exposure. The reasons why cancers develop are very complex and not entirely clear, involving both genetic and enviromental factors. We do know that one or more sunburns doubles the risk for skin cancer. Myth — If I have a growth or mole that has been there “forever,” it can’t turn into a skin cancer. Fact — Some melanomas develop as a new lesion, however many melanomas arise in preexisting moles that may be very familiar. It is important for you to become familiar with the growths on your body so that you are capable of recognizing any changes. Know the ABCDEs of melanoma. Myth — Using sunscreen ensures I have 100% protection from the sun’s rays. 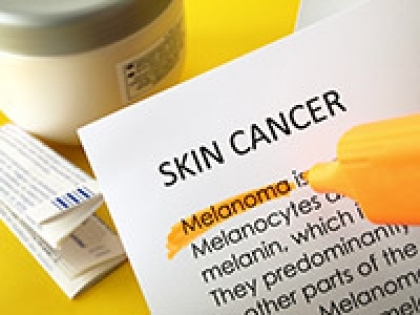 Excessive ultraviolet (UV) radiation from the sun or synthetic UV radiation from indoor tanning devices, are the major contributors of skin cancer. All skin cancers are managed best when detected early. Any skin cancer can appear suddenly as a new spot or develop slowly in or near an existing spot. In fair complected men, melanomas are most often found between the shoulders and hips, or the head and neck area. In fair complected women, melanomas most often develop on the lower legs as well as between the shoulders and hips. Any change in a spot needs the immediate attention of a Dermatologist. To see what melanoma looks like and to read more information about this deadly disease, please visit our friends at the Richard David Kann Melanoma Foundation who provide the SunSmart America ™ K-12 Curriculum and Resources to help promote sun safety education, prevention and early detection of skin cancer.